The World Series of Poker is known as being a haven for all sorts of degenerate bets involving multi-millionaire poker players. Can Erick Lindgren play four rounds of golf, back-to-back-to-back-to-back, from the pro tees, in the scorching hot Las Vegas sun while walking and carrying his own bags, and still shoot under 100 each round? Can Mike Matusow drop a ton of weight over the course of one year, and weigh in at 181 pounds by the beginning of the 2008 World Series of Poker? Can Huck Seed learn how to do a standing back flip in just two months? 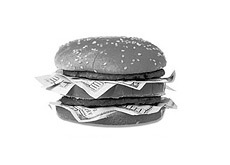 Can Howard Lederer (a vegan) eat a hamburger for $10,000? These are some of the bets that have taken place over the past couple of years. A great deal of betting is also done on the golf course, where millions of dollars are won and lost on a weekly basis in Las Vegas. The action really heats up during the summer months while the World Series of Poker is taking place. You'll have six figure golfing bets, tennis bets, and a wide assortment of other bets. The bottom line is - poker players love to gamble, and they'll gamble on anything and everything. As mentioned, the NY Times published a humorous article a couple of days ago, detailing some of these ridiculous bets. They mentioned the Mike Matusow bet. Matusow was cruising towards winning the bet, but then went on a cruise with his girlfriend. Wanting to enjoy himself on the cruise, he offered Ted Forrest (who bet him $100k that he couldn't get down to 181 pounds by the start of June) the chance to buy himself out of the bet for $70k. Forrest refused, and Matusow ended up gaining seven pounds on the cruise. This left Matusow having to lose a whopping 15 pounds in just nine days. The article points out that Matusow "didn't eat for the last five days, did a master cleanse and spent time in the Jacuzzi". He ended up winning the bet, weighing in at 179 pounds. The weight seems to be rapidly coming back on though, and apparently Matusow made a bet with Erick Lindgren that he would weigh less than 200 pounds by January 15th, 2009. The funny part of the story is that Matusow conducted the interview with the NY Times while eating a 20-piece Chicken McNuggets meal. Yes, Erick Lindgren won the golf bet. Yes, Mike Matusow won his weight bet with Ted Forrest. Yes, Huck Seed managed to learn how to do a standing back flip in just two months. And yes, Howard Lederer ate a hamburger for $10,000, even though he was a Vegan. Just another summer in Las Vegas.